Cargo I’ll define as “goods transported for profit.” Click here to see the range of cargoes posts. So what’s this? 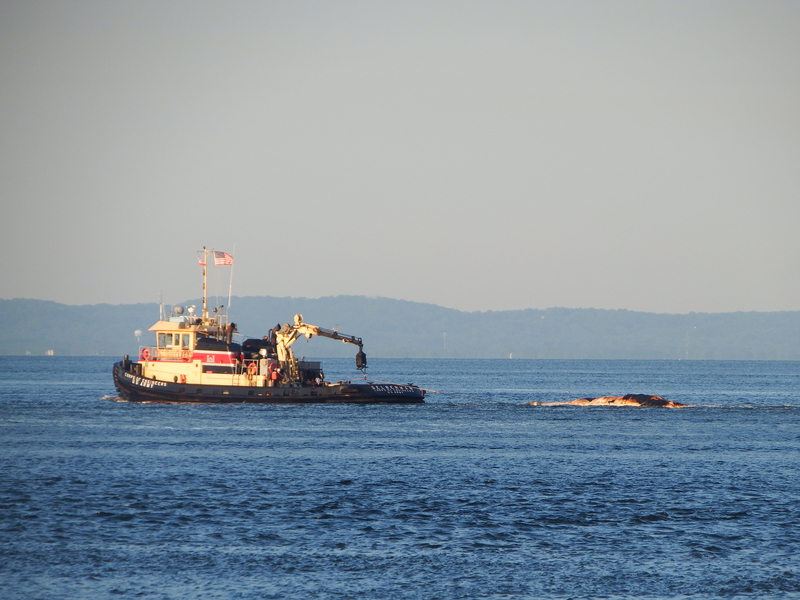 That’s what I wondered when I first glimpsed it yesterday, over by the Sandy Hook Pilots’ pier. I got no confirmation, but there’s no mistaking what this is. And there was this tugster post involving Onyx Arrow from just two weeks ago. 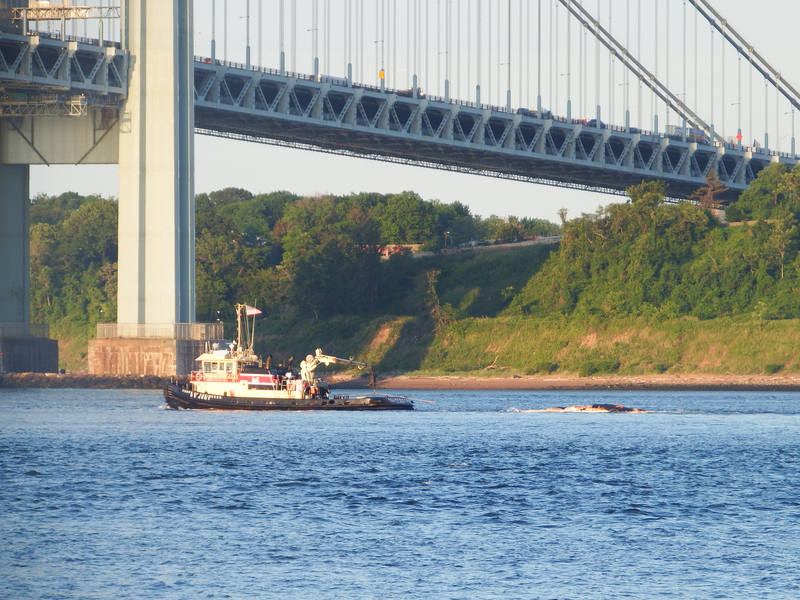 In an ideal world, I would have had means to look down onto the tow, say, from Fort Wadsworth or a drone. From my vantage I didn’t get olfactory evidence, and maybe I should be thankful for that. Just the facts . 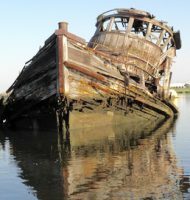 . . Gelberman towed the carcass and traveled a distance roughly 50 miles to the SE from the end of the Ambrose, and then returned. 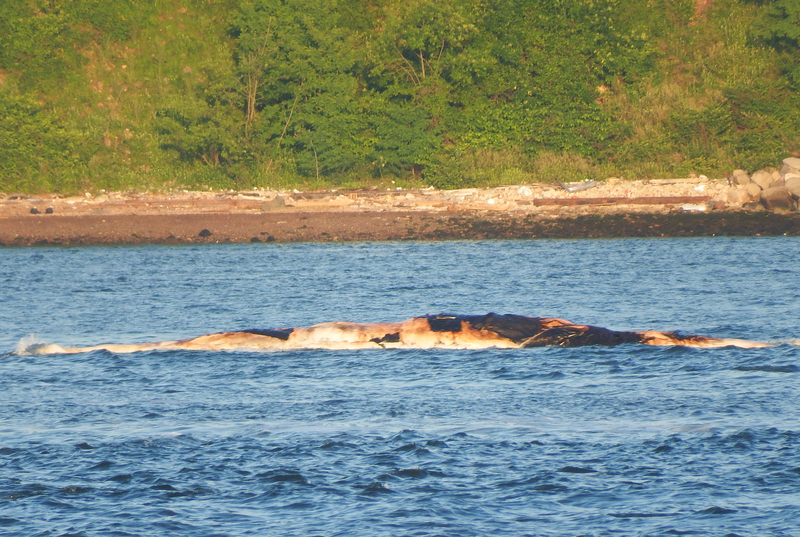 The whale, I gather from this NOAA article, at some point such that it would not drift back into land, became a “whale fall.” This surfing writer, based on who knows what authority, suggests this is the best way to dispose of such a carcass. So who profits here are the locals of all the boros being spared the smell of decay but also all the creatures in the food chain around the whale fall. Tangentially related and tied to the focus of most of my attention these days, did you ever hear the story about the what in the Erie Canal? Well, go back to 1891, a Capt. Nickerson killed a 65′ whale off Cape Cod. And he must have been really tired of salt water and his erstwhile profession because he decided to try making a fortune showing off his catch to folks along the inland waterways, in this case the Erie Canal, that highway mainlining immigrants into the American heartland and creating boom towns along the way. 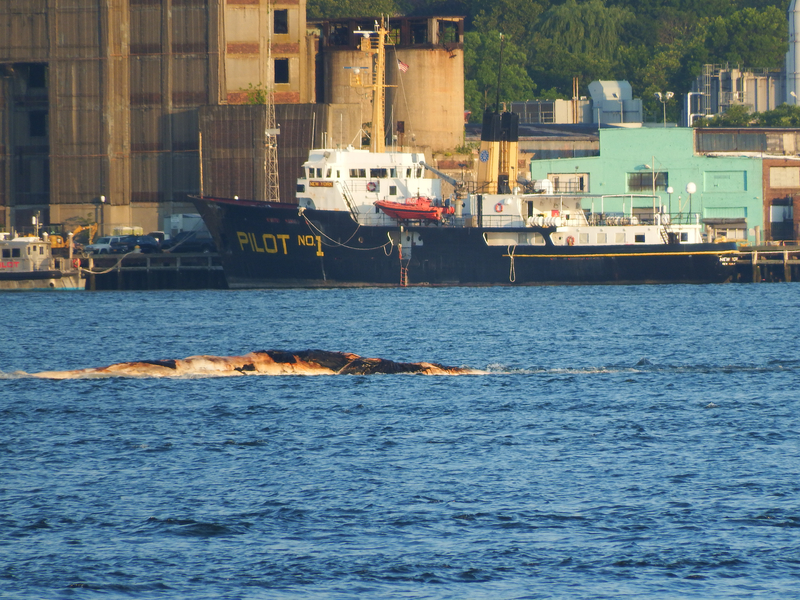 I’m not sure what sort of steamer he used to tow the whale, but westbound he went, stopping at docks and charging folks . . . kind of like his own unique Coney Island show. I’m told that the farther west he got, the less he could charge . . . Check out this article telling of the whale’s impact in central New York state in November 1891 . . . and for anyone not familiar with the route, Seneca Falls is on a cul-de-sac off the route to Buffalo. Rembert, frequent contributor of wit and esoterica here, read my mind and informed me of a beluga that swam more than 100 miles up the Rhine back in 1966, animating a generation with a desire to clean up the watery environment and more . . ..
All photos above by Will Van Dorp. And on yesterday’s post with the three landscape shots . . . commenters gussed it: photos #2 and 3 were both taken from the Newburgh area looking south. Photo #1 prompted me to do the post because at first glance, I thought it too was a photo taken from the Newburgh area looking south. More careful study showed it was not. Anyhow, a friend and former colleague Scott Stroot recently took that photo in Oregon, and wrote this: “Columbia River Gorge, just downstream of Hood River OR. Some of the most breathtaking scenery in the world (IMHO). Tugs & barges sharing the river with sail & para boarders is a pretty common sight in certain spots. Eastern end of this gorge is likewise dramatic, but the topography is temperate desert, as opposed to “wet side” verdant [as he usually sees in Kentucky]. Absolutely stunning.” This is all the encouragement I need to add the Columbia River Gorge to my very long list of places to gallivant . . . Thanks, Scott. The aftmost end of the whale should have been marked with a diamond dayshape, per Colregs international rule 24(h)(iii) or inland rule 24(g)(iii). I had not thought of that, but it’s certainly an “inconspicuous, partly submerged vessel or object…” Thx, Les. Esoteric! It took some minutes to convince the interested party, that this isn´t a typing error and the blog not a pretext for showing, enjoying and commenting mermaid – pictures. I cherish yr arcane additions to this blog, but should I read between the lines and conclude you wish to see more of the mermaids? The Netherlandish have their Zeemeerminnenparade . . . surely this blog would be enhanced by a Meerjungfraufestival . . .. ? A quick search tells me, that Germany isn´t underdeveloped mermaid-territory but offers the whole array of festivals, contests, trainings etc. . As german girls are through with hen nights, mermaiding is the big thing now. Aha. Finally I understand, why everybody is talking about globalization.